Our oil paintings are completely hand-painted, absolutely no printing. 100% original craftsmanship starting from a blank canvas and ending in a museum quality artwork. Choose from thousands of images for your museum quality works of art, in any size at an affordable price. Order reproductions of masterpieces, classic and original paintings, originals, or create a custom order from your favorite photo, painting, or portrait. 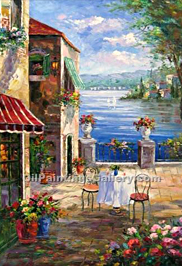 Oil Paintings Gallery sells museum quality hand-painted oil paintings and frames for homes, offices, restaurants, and other places of business and leisure. We have assembled literally thousands of famous artworks from the classics like Leonardo Da Vinci and Claude Monet, to more contemporary artists and styles, in a convenient and fun online shopping service. Choose from scores of themes, genres and artists including Van Gogh, Renoir, Gauguin, Gustav Klimt and many more. We have a huge selection of abstract art paintings, animal paintings, figurative oil paintings, religious oil paintings, still life oil paintings, flower paintings and landscape paintings that are available in our collection. All of our paintings are hand-painted (no printing involved) in oil on high-grade canvas, with only the highest quality materials and techniques. Your order of fine art oil paintings is then promptly delivered to your home or office, framed and ready to be hung. Our oil paintings are made traditionally, wiouth using printers or any other compromising method. By avoiding the use of computer technology (and printing presses) we distinguish ourselves from the competition—every painting in our collection is crafted by hand and created from scratch. They are painted by real artists who start from a blank canvas and step by step create replica paintings according to the valued costumer order. Our skilled artists even paint custom oil paintings of your own digital photos. Each individual painting is carried out with precision and beauty using the highest quality of oil painting materials and techniques. Abstract, Contemporary oil paintings, American Realism, Folk, American Impressionism art for sale, Art Deco, Art Nouveau, Pop Art art, Classical, Academic, Neoclassical artwork for sale, Expressionism artwork, Fantastic Realism oil painting, Figurative art, Hudson River School, Ashcan School, American, Tonalism art, Impressionism, Post Impressionism art for sale, Maritime Artists oil paintings, Naive art for sale, Orientals oil paintings, Pre Raphaelite painting, Realism, Naturalism oil paintings, Renaissance, Baroque art, Rococo painting, Roman School paintings, Romantic artwork for sale, Surrealism, Cubism, Romanticism, Fauvism, Futurism oil paintings, Symbolism artwork for sale, Victorian, Neoclassism artwork for sale, and more! Abstract art, Boats and Ships artwork for sale, Christ, Bible and Religious Theme painting, Flower, Garden and Farming artwork, Knight artwork, Landscape artwork for sale, Still Life oil paintings, and more! Sir Lawrence Alma Tadema oil painting, Albert Bierstadt reproduction, Antonio Canaletto painting, John Collier painting, Leonardo Da Vinci replica, Thomas Gainsborough painting, Edmund Blair Leighton artwork, Claude Monet famous painting, Harmenszoonvan Van Rijn Rembrandt artwork, Pierre Auguste Renoir reproductions, Julius Stewart reproduction, Joseph Mallord William Turner artwork for sale, Vincent Van Gogh oil painting, John William Waterhouse art for sale, George Watts artwork for sale, and more! Free stretching with any frame purchase! Framed oil paintings are hassle free, delivered right to your door, and ready to be hung. All of our frames are made from solid wood. We have a huge inventory of fine art oil paintings that includes impressionist and renaissance as well as Leonardo da Vinci's The Last Supper and Mona Lisa, Van Gogh's The Starry Night, and Claude Monet's flower and still life paintings. We have quite an extensive collection of Venice, dog, horse, bird, flower, landscape, and religious artwork including Jesus paintings. Oil Paintings Gallery is possibly the world's largest and most convenient repository of fine art works for sale. So if you are looking for an oil painting from the renaissance period or a more modern painting, even custom paintings from your own digital photos -- we are your one stop shop for an incredible art gallery experience that will captivate you. On our site you will find this and more. We offer Worldwide Shipping! 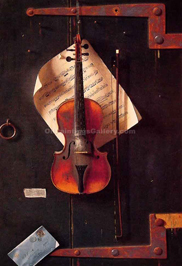 Find the world of fine art oil painting reproductions at your fingertips. Oil Paintings Gallery is the fine art lovers' only Internet destination! We have an extensive & rapidly growing collection of oil paintings. Here are some of our painting subjects: Abstract art, Boats and Ships artwork for sale, Christ, Bible and Religious Theme painting, Flower, Garden and Farming artwork, Knight artwork, Landscape artwork for sale, Still Life oil paintings, and more!